J Hugh Edwards, was a supporter of David Lloyd George, a member of Cymru Fydd and later Liberal MP for Mid Glamorgan and Accrington. In 1913 he published a multi-volume biography of Lloyd George, wth a short history of the Welsh people. 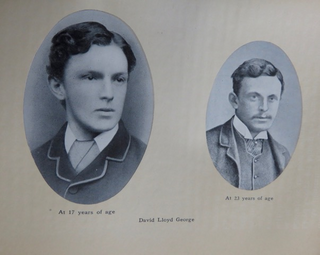 It contains many photographs of people and places which were important in Ll.G's life, including his vastly influential uncle Richard Lloyd, political contemporaries, and figures involved in major events from his life such the Llanfrothan burial case. It also has pictures of Lloyd George as a young man, (seen here aside) one of him when first elected to Parliament in 1890 and very rarely one of him as a small child in his third year with his sister.